The most powerful practice management software with premium access to Practo platform. - Easy re-scheduling and cancellations by patients. - Turn by turn directions using smart SMSes. 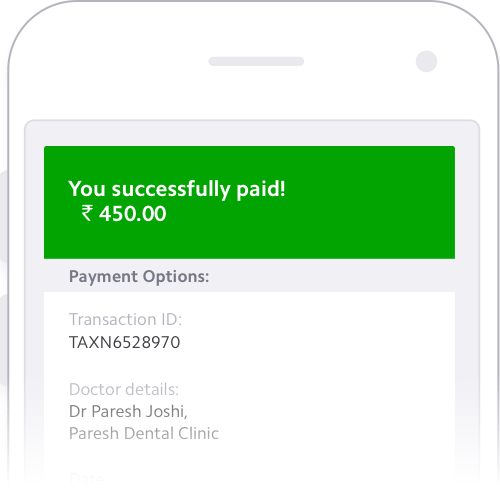 - Patients pay online, even before they reach the clinic. - Collect all due payments in just 1-click. "The shift from manual to automated setup was gradual but showed results instantly. 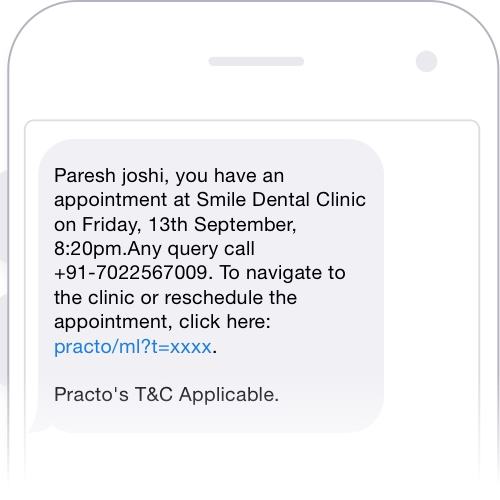 Practo Ray’s appointment reminders dropped no-shows by over 70% by sending reminder SMSes just hours before the appointment…"
- 1-click scheduling for the entire treatment duration. - Customize timing and content as per your needs. - Allow patients to followup conveniently from their homes. - Set availability and time period for post-consultation chats. - Refer to your patient’s history and offer personalized care. - Leverage templates to provide advisory faster than paper. 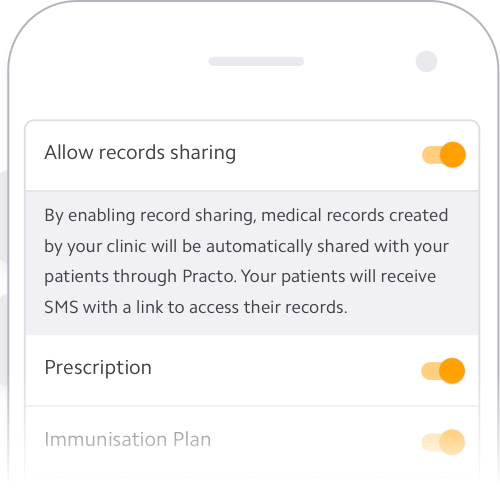 - One-time setup for automated sharing records with patients. - Save paper, save ink, save money. People, with whom digital records are shared, book 25% more appointments with the same doctor. 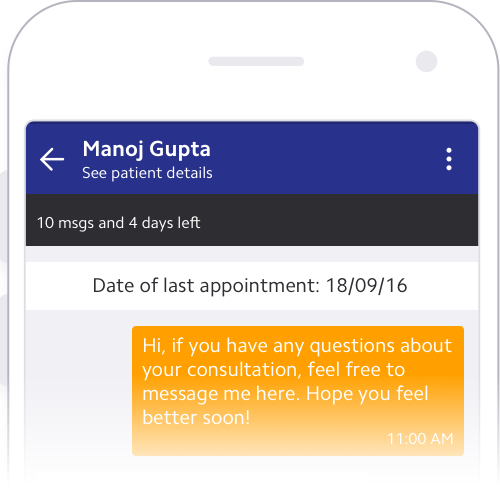 India’s first virtual assistant for clinics that takes care of clinic’s overall call management needs and enables instant appointment booking. Respond to patients 24X7 and never miss a patient call for appointments during and after clinic hours. Let patients directly book appointments over phone as per your availability without you clicking a single button. 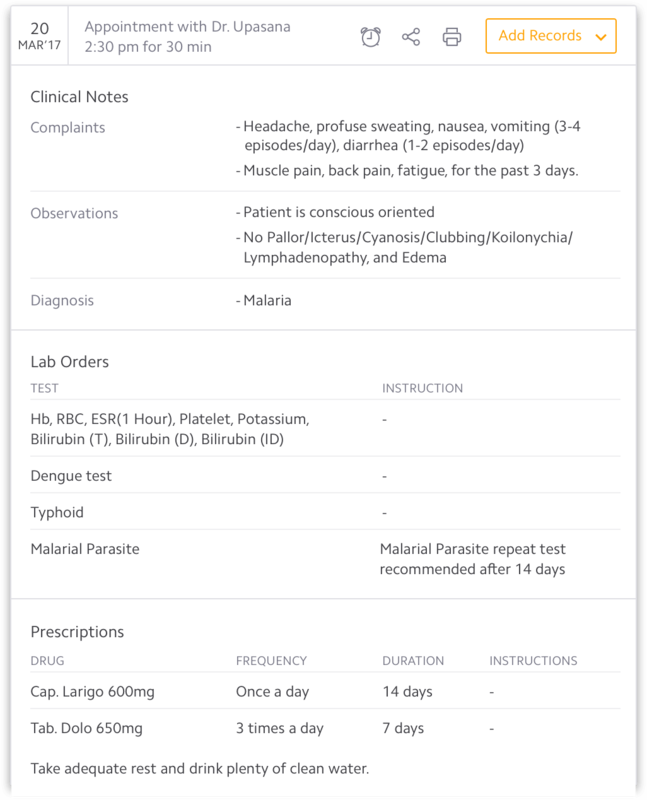 Enable appointment booking, share clinic details, capture patient’s messages, connect to receptionist & doctor and customize audio recordings. 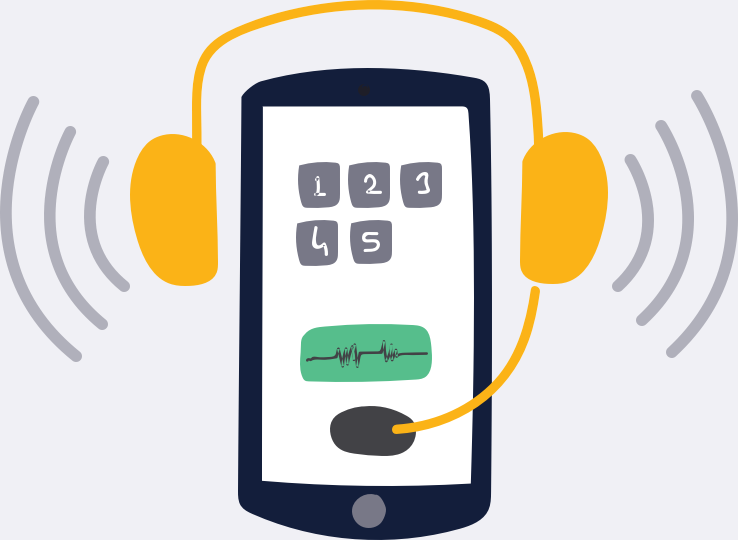 Keep a close check on quality of every patient engagement with free auto-recording and real time reporting for all calls. IVR is available in 7 vernacular languages namely: Hindi, Marathi, Malayalam, Tamil, Bengali, Telugu and Kannada. Form could not be submitted successfully Please try again in sometime. Thank you for your interest. One of our representatives will get in touch with you soon. Get reviews and recommendations from all your patients and enhance your online presence. Patients love having all medical records on their phone and also, the doctors who share. 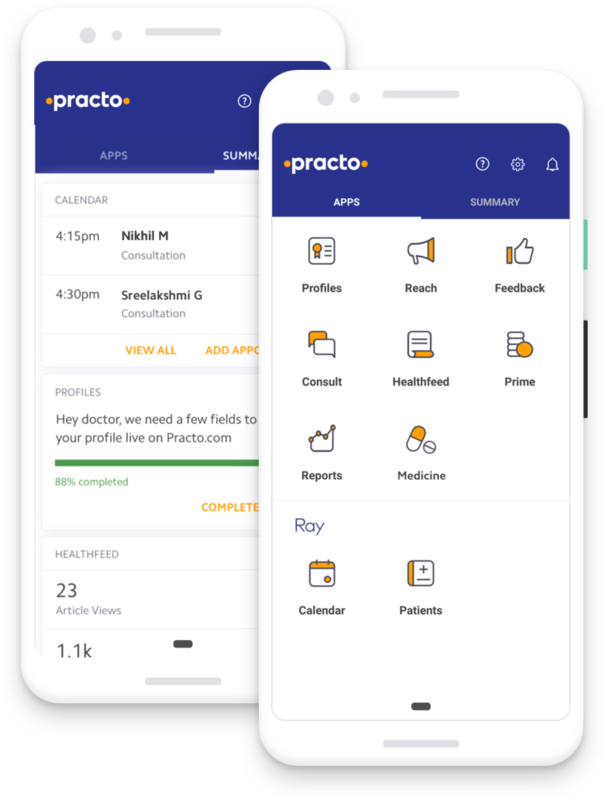 Get yourself showcased in the ‘My Doctors’ section on Practo and get upto 30% repeat appointments. Additional layer of security to make abolsutely sure that unauthorized access don’t happen. Ensure that Ray is accessed only from places that you feel safe. Read more about our data security measures at our blog. You are one step away from making your practice more efficient. Do you own a clinic ? Your trial creation is in progress. Will Ray help me get more patients? No. Ray is a practice management software and not an advertising product. It helps in managing your practice better and offering a seamless experience to your patients. All Practo servers are hosted within HIPAA-compliant Virtual Private Servers inside Amazon Cloud, with multiple data backups. This means that your data is totally safe. Practo is also working with Data Security Council of India for excellence in data privacy. To read more about our data security measures, please click here. Will Practo help me migrate from my existing software? Yes, certainly. Our support team will help in migrating your data from your existing software to Ray. Will Practo customise the software for me? 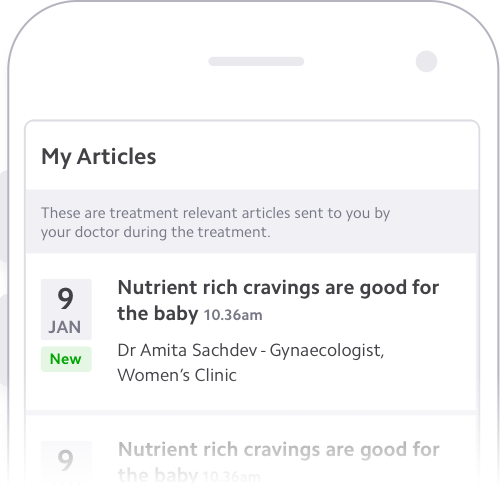 Ray is a feature-rich software and has been built with a lot of research and feedback from doctors across the country. Immense effort has been put to ensure that Ray has features that suit the needs of all practices. Even though we do not sell customised software for individual doctors, our team does add new features continually, based on popular demand. How much time do I need to invest to get started? Ray is extremely easy to learn and use. To help our customers, we have a vast library of help articles and training videos, which will act as a quick reference for you and your staff while learning any feature. In case you need further assistance, our support team will be happy to help. What about my staff? Will I have to teach them how to use Ray? No, you don’t have to teach your staff. We are there to help. To learn any feature, your staff can refer to the vast library of help articles or watch training videos, at their convenience. They can also reach out to our support team for more assistance and training. What will be my renewal price? Will it be same as my purchase price? I am not quite sure. Can I try it out first? The trial version will be active for 7 days. Trial version is completely free of cost. You can choose to purchase a subscription of your choice anytime during the trial period. How many features will be accessible on the trial version? Trial versions will have all the features from our best plan. You can purchase a subscription of your choice anytime during the trial period. If I purchase a subscription before the trial expires, will I lose the remaining trial duration? The subscription will start only after the trial ends. This will ensure full usage of the trial and paid subscription period. I am an existing user of Ray by Practo. Can I still get a trial? Yes, every time you add a new practice to your Ray account, a 15-day trial will be activated for the new practice. Our customer support team is always ready to help you. You can contact the support team with any queries via email to support@practo.com or via phone to +91-88805-88999 or via live chat within the software. A powerful app that lets you manage and grow your practice.